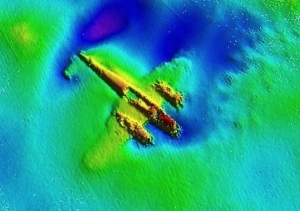 A joint team from salvage company SeaTech and the Royal Air Force Museum have successfully recovered an intact Dornier 17 medium range bomber from the Goodwin Sands in the English Channel. The plane was first located in 2008 and in the intervening years efforts have been made to bring together a team to recover and restore the aircraft. Dornier 17s were medium range bombers developed for the Nazi Luftwaffe and put into service 1937. The plane is one of the lesser known Luftwaffe designs as it was largely obsolete by 1942. Powered by two 1,000hp 9-cylinder engines, the plane could reach speeds of 265mph while delivering a 2,200 lb. bomb load. There are currently no surviving examples of a Dornier 17 as most were melted down after they were shot down or confiscated after the war.